Upon news of Jack Heller’s passing on October 20, 2018, faculty and staff reflect on his legacy as former department chair, scientist, and friend. Some call him the “happy chair” others reflect on his love of numbers and how important he was to building a strong foundation for the Department of Computer Science (CS) at Stony Brook University. 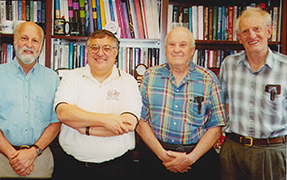 Whether it is a longtime colleague or staff member hired by Jack over 30 years ago, it is with a heavy heart that we reflect on Jack’s time at Stony Brook University as we learned of his passing at the age of 96. Department chairs gather at 35th anniversary of the department. Jack Heller is third from the left. In the beginning, Jack worked to recruit good people and supported them when they came, according to David Warren, professor and CS chair from 1996-1999. “He definitely had a profound influence on the early stages of our department’s development,” says Warren. Long time staff member Betty Knittweis remembers “Dr. Heller” well. “Dr. Heller would invite everyone (faculty, staff, and students) to his home every Friday to celebrate the end of another great week. Back then we only had about 15 faculty, 35 graduate and 100 undergraduate students and most of us would go and crowd into his living room.” The crowd at his house would have lively discussions about prime numbers, theater, and of course computers, while the classical music played. His wife Myra, who passed away only 13 days before him, would be by his side at each “happy hour” and the annual summer gathering at Sunken Meadow Park where Jack could share his love of nature with everyone. Several years later, in 1969, Jack took a leap of faith and left New York University to join Stony Brook and GRIPHOS continued to serve as centralized approach for the consortium of museums until 1979. “Jack arrived here in 1970 at the time the Department of Computer Science was first formed. It was staffed by a small group of professors drawn from the Electrical Engineering, Physics and Applied Analysis departments and was given a small Digital Equipment Corporation computer, an even smaller budget, a lot of chalk to teach with and the benign neglect of the administration. The Department existed that way for several years until Jack took over as chairman and spearheaded a revolution which culminated in a $5M+ award from the NSF. This was the first award over $1M for the department which helped to transform the department. He had the vision to see what needed to be done, the know-how to formulate a plan, and the energy to make sure that every detail of that plan was executed. It is no exaggeration to say that in a few years he shepherded a department that was a sleepy backwater to a position that had national recognition,” says Art Bernstein, professor and former chair of CS. *At the family’s request donations can be made in his name to The Actors Fund in honor of his love of theater. Jack was indeed a nice guy who would talk your ear off if you let him, and I let him. I arrived four years after his time as chair, but it was always clear he was considered the guy who had made the department what it was, by force of personality. I was very saddened to hear of Jack’s passing. He definitely had a profound influence on the early stages of our department’s development. He worked to recruit good people and supported them when they came. I remember him fighting hard for salary increases in the early 80’s for those of us who got caught in a salary “inversion,” where new hires got higher salaries than those of us who had come earlier. I also remember a soccer game we played at a department picnic soon after I had arrived at Stony Brook. I inadvertently fouled him and knocked him to the ground. I was afraid I’d hurt the “old man.” He immediately popped back up, smiling, and ran on after the ball. He was a presence.